The plan centers on an enterprise geospatial database that supports desktop, web and remote clients at hundreds of sites across 13 UTM zones in 25 countries. SPATIAL developed a prototype, implemented the ISIP Plan, maintained and enhanced the GIS portal (ISIP) using onsite personnel: a full-time Geospatial Manager (GM) and Oracle Database Administrator (DBA), a Geospatial Analyst (GA), and a System Administrator (SA). In addition, to sustaining and maintaining ISIP functionality, SPATIAL is tasked to obtain ISIP’s Department of Defense Information Assurance Certification and Accreditation Process (DIACAP) Approval (Authority to Operate – ATO). USARCENT contracted SPATIAL to capture, organize spatial and non-spatial authoritative, reliable data for all real property assets within ARCENT’s AOR to comply with Title 10 requirements. Extracted and digitized features from imagery into SDSFIE GIS features using “best of breed” CADD and GIS technologies. Deployed a survey team in Theater to collect and verify assets and attributes at key locations throughout the AOR. Develop SDSFIE formats for mobile GPS devices used by the survey team. Collected about 337,000 GIS features using IKE GPS device. 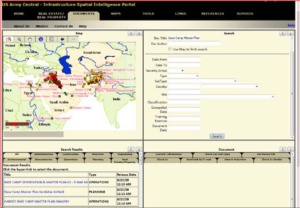 Developed web-based online viewer capability to share survey data, extractions, imagery and photos via an unclassified network. Georeferenced CADD data and imported features to Oracle ArcSDE geodatabase in SDO format using Bentley MicroStation Geographic, Bentley Map, AutoCAD Map3D, ArcGIS Desktop, ArcGIS SDE, Oracle 11g, and Oracle Spatial. Created and loaded into ISIP 300+ distinct SDSFIE Feature-classes with 500,000+ features and 50,000,000+ attributes.